Building possibility in the next generation of buildings. British Gypsum, part of the Saint-Gobain group, is the UK’s leading manufacturer of interior lining systems. Our mission is to develop innovative products and services that help customers build better spaces to live, work and play. In every kind of building – from home to work, from the local supermarket to the local hospital – we help to create partitions, provide comfort, protect against fire and insulate against sound. The preferred choice for generations of plasterers, Thistle plasters offer a full range of specific and multi-purpose solutions for all internal plastering needs and backgrounds. 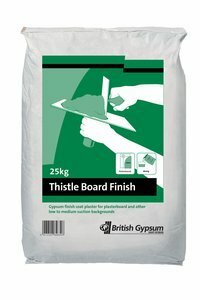 Thistle plaster products are designed to suit either hand or machine application. Their consistent performance, workability and reliability is assured thanks to our exacting manufacturing standards, which enable plasterers to maximise productivity and cut product wastage on site. Backed up by a range of compatible, high quality accessories, Thistle plasters produce a high quality surface that’s tough and durable. Thistle plasters meet all customer demands for an aesthetic, low maintenance internal surface finish for a range of standard and specialist applications.